Truly, I need to start with my annual trip to the All-Chrysler Show at Carlisle Fairgrounds in Carlisle, Pennsylvania, the second full weekend in July. This particular trip would have been in 2000. Arriving on Wednesday PM prior to the show, myself and at least ten other friends were pleased to find a 1956 Dodge, Long Box, ½ Ton truck in the Car Corral. The owner had left a note with the truck stating he would not be on the field until Saturday AM. When I was able to make contact on Saturday, another customer already was showing great interest. Through the day, I kept returning to the truck just to find out that the interested person hadn’t made his mind up yet. Eventually the customer gave the owner a deposit and, though I was disappointed, I figured it was “meant to be”. I left a phone number for the seller of the truck just in case he could shake another truck out of a barn in the West Virginia area he was from. The truck he sold appeared to be a fair truck for a fair price and was not getting a lot of attention because it was original and didn’t have a “Hemi” under it’s hood. On Sunday evening, after arriving home, my stepson, Colin, said there was a message to call this gentleman in WestVirginia. I was surprised that he might have found another truck so quickly. It turned out that the Car Corral buyer arrived home to NYC and apparently found out that his wife wasn’t as “excited” about his purchase and declined to receive the truck. The seller agreed to deliver the truck to me in Vermont for the asking price. He said he would grab his brother-in-law for the company, drive up Sunday, stay over, do the deal on Monday AM and drive home. 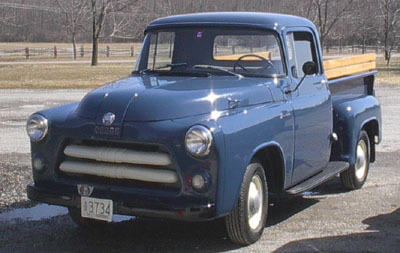 So… now I owned a 1956 Dodge, blue, Long Box, ½ Ton from West Virginia with 47,000 miles on it. Since I already owned a 1947 Plymouth Sedan, a 1952 Dodge ½ Ton, Low Side truck that I had previously restored, my “family” and “room” dictated that something had to go. 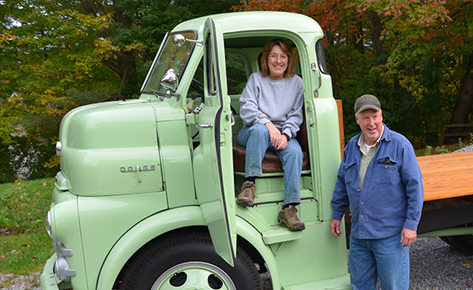 I placed an ad in Hemmings and my 1952 Dodge truck ended up with a wonderful family in Stowe, Vermont; when it could have gone literally “anywhere”. We were very pleased. I also had placed an ad in the Burlington Free Press, which I’ll refer to later. So… I used this truck for the summer of 2000. Now we finally come to February 2001. Snow is everywhere. I receive another phone call from Joe, my newfound West Virginia Mopar truck supplier. He tells me that he went to an auction in Virginia looking to buy some lumber to add onto his car storage area. Well… in a building at the auction was a 1956 Dodge, Short Box, High Side, ½ Ton pick-up with 22,000 miles on it and a title to prove it. He offered them all he had in cash, but was $700 too short and they wouldn’t accept the offer. While driving back to West Virginia, he thought of his Vermont “connection”. He just wanted to see someone who likes Mopars own and use this fine automobile. I thanked him for thinking of me, but my motor home and trailer were truly “buried” in snow and I really couldn’t afford it. Well… after a week of me stressing over my premature decision, I weakened and returned a call to West Virginia. My new Mopar friend said he’d drive the 75 miles to see and I said that he shouldn’t go through all that. I suggested just a phone call, maybe. A week later I called him again and he said he had looked into it again and it had been sold. I was so… disappointed. I asked if he knew to whom and he replied, “Yes to me”. After I sat down, he informed me that he couldn’t afford it either, but he paid the price, trailered it to West Virginia and was storing it in his garage until our spring, be it July or August, and I could come to get it. I asked, “What if I can’t afford it?” and he said, “We’ll see what spring brings”. So… April 2001, Joe Paradis, another long time active VAE member, accepts my invitation to travel to Hedgesville, West Virginia and pickup a pick-up. The trip was a very memorable, fun time. One conversation was truly interesting though. Joe asked me if I had seen this truck or a picture of it and I said, “No”. He said, “You mean we’re traveling to West Virginia to get a truck you haven’t even see a picture of?” and I said “Isn’t that nuts?” To which he replied, “No, I’ve done it a couple of times myself and they turned out just fine”. We had left Essex Jct, Vermont at 8 PM on a Monday evening and were back at 11 AM on Wednesday. The truck has since been taken apart, blasted and repainted in and out with its original color. I have driven it for pleasure and to work for over 3,000 miles since its purchase. 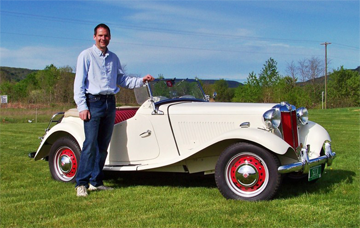 In July of 2002, shortly after its restoration, we went to Carlisle and received two (2) awards at the All-Chrysler Show. We’ll maybe see you there in 2003. The truck is all it was “hyped” to be and more. I’ve met a great friend in West Virginia and had a great trip with a VAE friend to boot. Joe also was a big help with truck pick-up bed and sideboards. I guess you maybe thought he only did plaques. Now… back briefly to my first ‘56 Dodge truck. When advertising my ‘52 truck locally, a neighbor five blocks away, answered the ad, but really wanted the ’56 because of its “long box” for bicycles. I told him it wasn’t “for sale”. 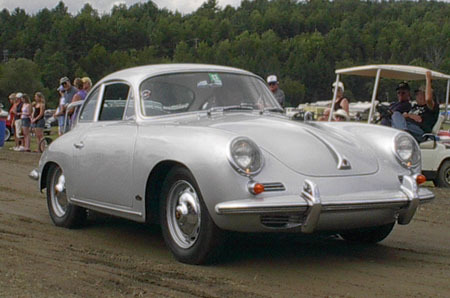 Well, when I advertised the first ’56 upon returning from West Virginia a year later, this neighbor just about “ran over” and now owns it…. Bottom Line… Finally. The ’52 Dodge I restored is in Stowe, Vermont, the ’56 Dodge I purchased through Carlisle is five blocks away and our candidate from Aroda, Virginia is with me, in Vermont. Who could ask for anything more… But, that sounds like a musical. 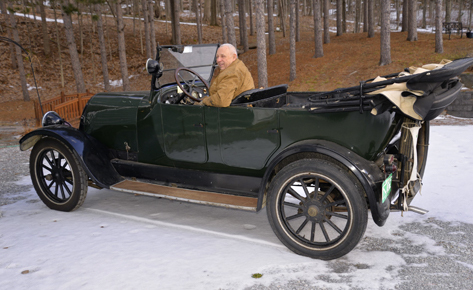 Herbert was Marvin’s grandfather and Marvin sent along this great picture of Herbert with his 1919 “T” Ford. Marvin writes… “I have a snap shot of him and the “T” when it was near new. Scrap drive of WWII was the end of that Ford. My cousin and I played in it when I was a wee lad out behind the barn. My family settled in on the Long Point part of Ferrisburg in 1792. They moved from Bennington. Does this make me a real Vermonter? 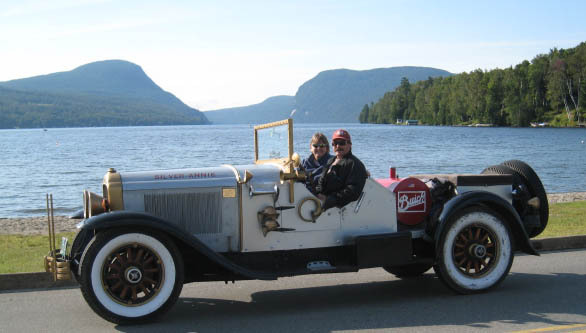 Being on the lake, they sold “cool” to the blacksmiths, and later sold gravel to the railroad. 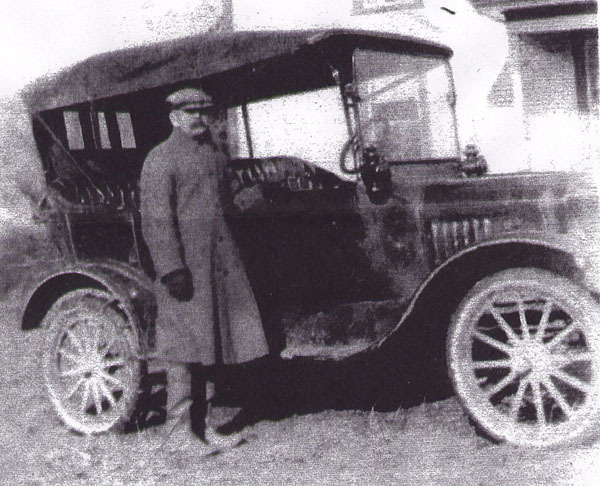 The Ball family was one of the first to sell leases to campers at Long Point. My grandfather had several farms and two wives but not at the same time. On one farm he sold gravel to the town for years. The old timers would do anything for a nickel and lived well, back then. Others in the family had sawmills in Charlotte and Shelburne. 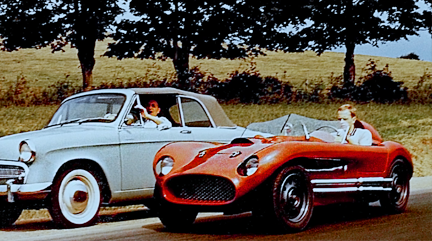 Emanating from Quarry Hill in Barre Town on the 27th of July 2003, will be the exhausts of classic and chrome vehicles of VAE members and guests. 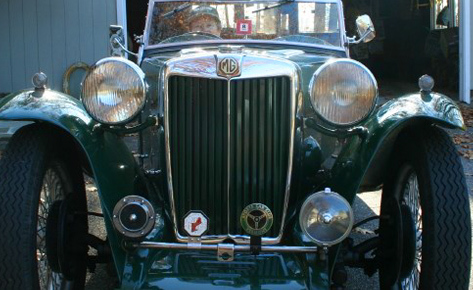 The 2nd annual cruise-in event on Sunday between 1 and 4 P.M. will raise funding for Camp Ta Kum Ta, Vermont’s camp for children with cancer. The 2002 event raised $800. Member and track host Ken Squire will MC the action with a possible assist from Buster the wonder dog. 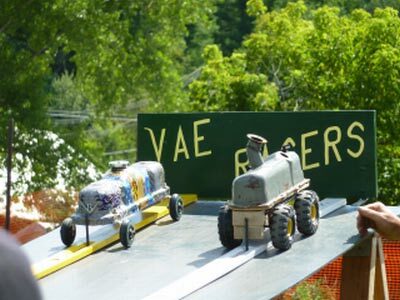 Plan on being entertained under the tent with complimentary ice tea and having your vehicle photographed on the track for VAE’s archives. Ken will oversee the closing ceremonies, which include car door prizes and appropriate awards. Dash plaques will go to the 1st 150 cars that register. Ray Tomlinson, Gene Napoliello and Ken Squire are waiting for your call along with the children who will directly benefit. 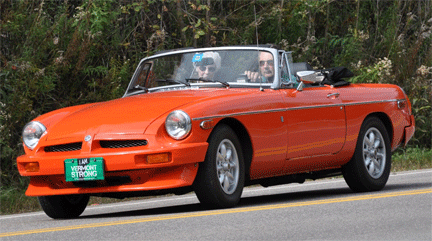 Your gift will be acknowledged at the cruise-in and in Wheel Tracks. Thunder Road hats will also be given by the co-chairs to members participating in the Thursday evening, July 24th cruise around the track at intermission and the Barre Home Coming Parade on Saturday, the 26th. Dash plaques for last year’s participants are now being retro-fitted as well. Plan to attend or donate to this special day for Camp Ta Kum Ta.